For pet lovers, any sign of eye problems should mean an immediate visit to the veterinarian. It’s not just the discomfort, pain and irritation. It’s also the very real risk of permanent damage caused by a delay. Here’s our guide to the common eye problems of dogs and cats. Warning: some pictures are quite graphic. There are many other rarer diseases, so please see your vet for an accurate diagnosis. Can you see the eye in the picture at the start of a normal old dog? Now compare it with the true cataract pictured here. 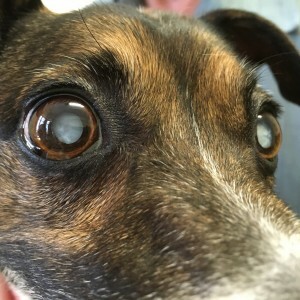 Beware the confusion: most dogs said to have cataracts actually have ‘senile nuclear sclerosis’. This is the common cause of a bluish haze in old dogs’ eyes and has a minimal impact on vision. Cataracts are opacities on the lens, usually white, that block light from reaching the retina. Once they cover the whole lens, that eye is blind. The dog pictured had successful cataract removal and can now see again. 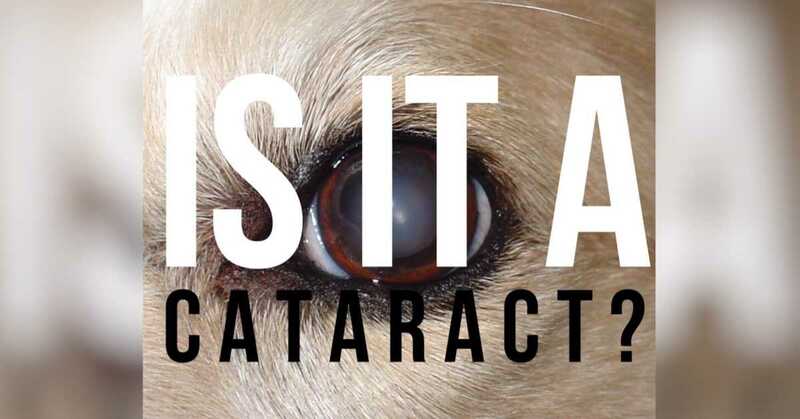 Most cataracts have no known cause but they also occur commonly with diabetes in dogs. Importantly, cataracts can also occur with PRA (see below) so retina testing is essential prior to surgery. 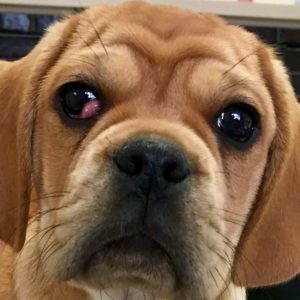 ‘Cherry eye’ is a fun common name for prolapse of the tear gland of the third eyelid. If affects mainly breeds with shorter faces like this Pugalier. Treatment is a straightforward surgical procedure to return the gland to its correct position. It should never be removed, as this can lead to ‘dry eye’ (see below). ‘Conjunctivitis’ just means inflammation of the tissues that join the eyelids to the eyes. 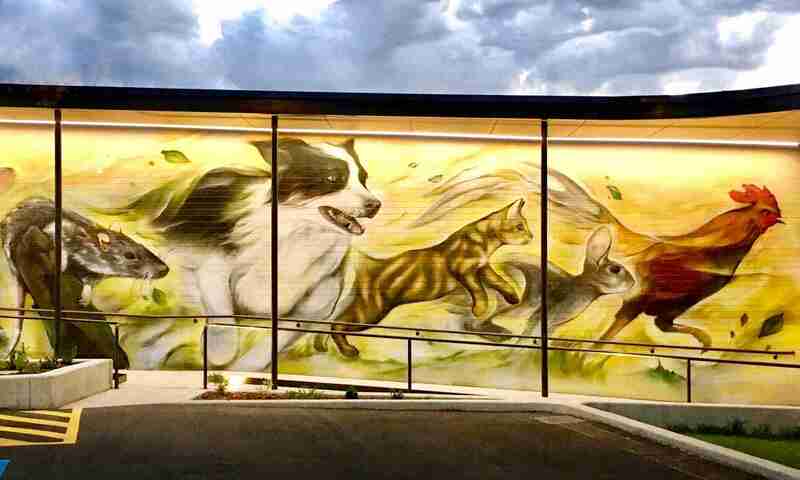 When it’s allergic, as happens a lot in dogs in Adelaide, the discharge is usually clear. When it’s bacterial, the discharge is usually green or yellow, as in the picture. Note also the red sclera (‘scleritis’- see below). Cats are another story. 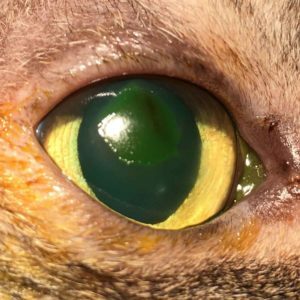 Cat conjunctivitis can look like dogs, or it can look like the second picture. We call this swelling of the conjunctiva chemosis. 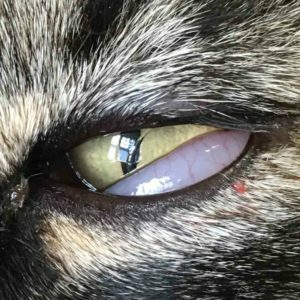 Conjunctivitis in cats is usually caused by infection wth either viruses or bacteria. A corneal ulcer is really just a wound on the cornea. Like the rest of the body surface, the conjunctiva has a thin layer of epithelial cells that act like a skin. When it gets damaged, however, the lack of a blood supply means that healing is often slow or nonexistent. Ulcers can deepen quickly and threaten perforation of the eye (see later) or just persist and cause chronic pain. Symptoms are usually just a weepy eye that blinks or closes a lot. Most get better quickly with treatment. 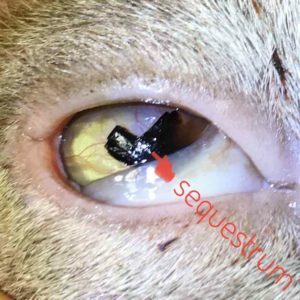 Sequestra are areas of cornea that die away and turn black. At this point they are best removed by a specialist to allow healing. Some shallow ones, like in the picture, can fall away and heal by themselves. 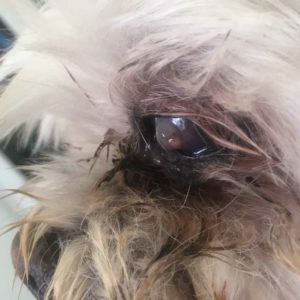 The dog pictured had a corneal ulcer that ruptured the eye. You can see a whitish area; this is corneal oedema caused by fluid entering the cornea through the wound. It’s always a bad sign when seen. These eyes can still be saved with a prompt referral, otherwise, removal is essential. This case is thought to have occurred due to hair and discharge touching the eye. Dry eye is the common name for keratoconjunctivitis sicca, an eye inflammation due to insufficient tear production. It is usually caused by autoimmune destruction of the tear glands. If untreated, the lack of tears causes the eye to be permanently infected, painful and blind. That’s the bad news. The good news is that dry eye is easily treated if recognised in time. Clues are a red eye and sticky yellow discharge which gets better with antibiotic ointment but keeps coming back. The eye often lacks its usual sparkle and looks dull. Diagnosis is by measuring the length of tears on a strip of special paper over one minute. Entropion refers to an eyelid rolling or folding so that external hairs come into contact with the cornea. 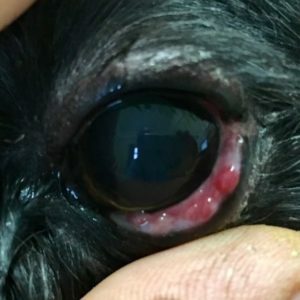 Not only is it extremely irritating to the affected animal but it can cause corneal ulcers see above or permanent scarring. Most entropion is caused by genetic factors in breeds such as the Shar Pei. It can also occur following infections or with old age. Sometimes, like the cat pictured, no cause can be identified. Treatment is a simple surgical procedure. Episcleritis is inflammation of the white of the eye, and is very hard to tell apart from other causes of redness. The case pictured is an unusual variant called nodular episcleritis which we diagnosed via biopsy. Note how similar it looks to cherry eye (see above). 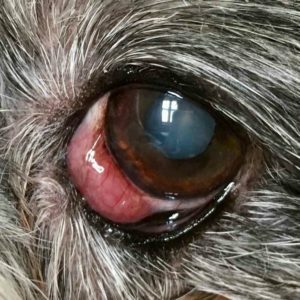 Episcleritis usually responds well to prednisolone drops, but often needs treatment for life. The example pictured disappeared completely over a period of six months. Grass seeds (foxtails) commonly get lodged in the conjunctival sac or behind the third eyelid in spring and summer in Adelaide. Signs are a red, painful eye with a yellow discharge. As you can see from the video, relief can be immediate. Visit our page on grass seeds in dogs to learn more. Glaucoma is an abnormal increase in pressure inside the eye, usually due to blockage of fluid drainage. If untreated, it quickly leads to extreme pain, eye swelling and blindness. 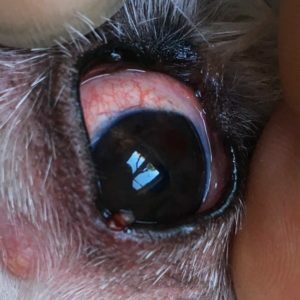 Most cases are due to breed-specific abnormalities but it can also occur after bleeding (‘hyphaema’) or inflammation inside the eye (‘uveitis‘). 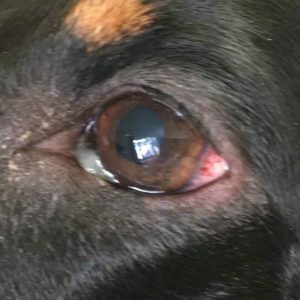 It’s important that vets rule out glaucoma with any unusually red or painful eye. The video shows glaucoma testing at Walkerville Vet. Prompt referral can save the eye and prevent the same thing happening to the other one. 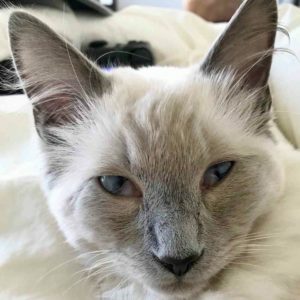 Haws is the folk name for protrusion of the third eyelids in cats. It is usually caused by a viral infection enlarging the lymph glands in the area. Haws should go away once the infection resolves, which can take some time. Chronic superficial keratitis (CSK) is another name for pannus. It is an inflammatory disease that usually starts on the sclera (the white bit) and spreads over the cornea. It can be easily treated if caught early enough but will cause permanent scarring if not. CSK has a relationship with ultraviolet light, and so is more common in sunny countries such as Australia. PRA is a late-onset genetic disorder that affects certain breeds such as poodles. It causes a slow loss of vision from middle age until the animal is completely blind, often associated with cataracts (see above. Early signs of PRA are often missed. See blindness below. There is no treatment but dogs usually adjust well to blindness and continue to lead good quality lives. 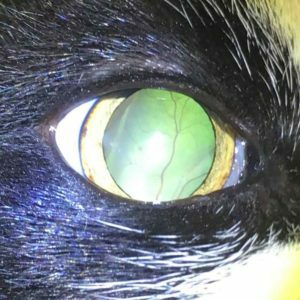 The picture above of a cat’s eye was taken only using an iPhone and shows the spooky appearance of a detached retina. You might be able to see that it folds up from the left in a large bulge. The fact that the pupil is dilated, though not fully, tells us that although vision is poor, it is not yet absent. 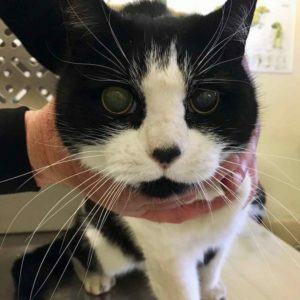 With prompt treatment to lower blood pressure, many cats with detached retinas regain normal vision. However, once the retina fully separates, blindness is usually permanent. See blindness below. Styes are infections of the meibomian glands of the eyelid. They can be visible on the outside or, as in this case, on the conjunctival surface. Treatment is via antibiotics. 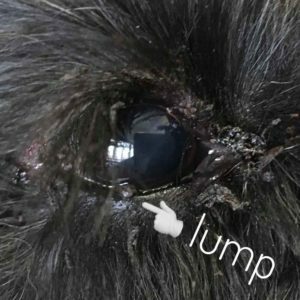 Eyelid tumours are very easy to overlook but shouldn’t be. 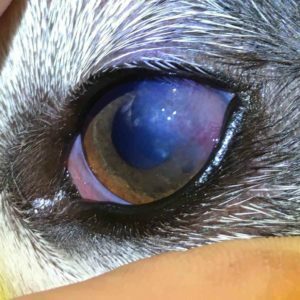 The leading edge of the eyelid needs to be perfectly smooth. Even tiny lumps will cause red, weeping eyes. Removal requires precision surgery to take out a wedge of eyelid and rejoin the edges seamlessly. Like just about everything else with eyes, speed is of the essence. If eyelid lumps get too big, removal becomes impossible without distorting the eyelid shape. Dry eye, pannus, and entropion can also lead to blindness via corneal opacification but this would require severe levels of neglect. 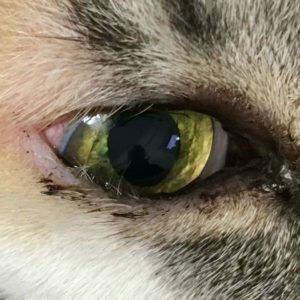 The picture shows the appearance of dilated pupils in a cat. This is an emergency. See retinal detachment above. Dogs cope much better with blindness than cats, probably mostly because their causes of blindness occur slowly giving them time to adjust.